Sinanian Development, Inc. | Construction. Development. Management. Sinanian is proud to announce that it was selected as the general contractor for the proposed development known as the Garden Brook Senior Village Apartments, located in Garden Grove, CA. This unique project involves the adaptive reuse of a half-built structure dubbed the “Rusty Skeleton” by locals. The project, originally slated as a mixed-use retail and luxury condominium development, had been abandoned for over a decade, a magnet for decay and crime in the city. This new adaptive reuse project introduces 395 below-market senior apartments, along with 13,000 SF of restaurant and retail space and over 25,000 SF of community and recreational area. The mission is to transform an unsightly steel frame, visible from the Garden Grove Freeway, into a fresh new gateway for the city. Sinanian will break ground on this project in the coming months. This project was awarded a 2018 Gold Nugget Merit Award Winner for Best Senior Community of the Boards. Sinanian is proud to announce that it was selected as the general contractor for the proposed development known as the First Point Apartments, located at 2020-2110 E. 1st Street. The project calls for the construction of a six-story building that would feature 552 rental dwellings above approximately 10,000 square feet of ground-floor retail space and a 620-car parking garage. Plans call for a mix of one-, two-, three-, and four-bedroom units, which are described as "affordable family apartments." Architects Orange is designing the podium-type complex, which will incorporate eight interior courtyards, which are being designed by Thomas H. Phelps Landscape Architecture. 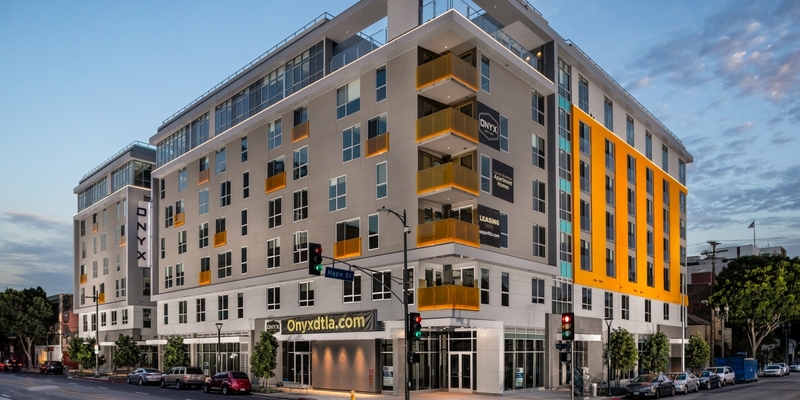 Sinanian has completed construction of the Topaz Mixed-Use Apartments near the Arts District in downtown Los Angeles. This project is comprised of 159 dwelling units of wood frame construction over a podium. The project also features seven retail spaces along Los Angeles Street and two large retail spaces along Main Street. The building offers two levels of subterranean resident parking and amenities include a fitness center, pool/spa, courtyard and other community rooms.